Although street photography is still very much a niche online, here are the top street photography blogs I regularly follow online. Although American Suburb X brands themselves as more of a “photography and culture” magazine, they consistently have photo-essays and interviews with street photographers. If you look at any of their features, they are very well-written and long-format (something that a lot of sites no longer feature). Check out this great feature about Garry Winogrand here. Where would street photography be without Leica and rangefinders? Regardless, they feature many great interviews with street photographers on their blog and also keep us in the loop with what the masterminds at Leica are up to. Definitely keep them bookmarked. Out of all the street photography blogs I listed, “B” from Blake Andrews has definitely got to be my favorite. Sarcastic, rugged, and raw– Blake Andrews never sugarcoats anything he has to say that is on his mind. Not only that, but the man has a fantastic eye (he is in In-Public after all) and has great photo-analyses and essays. Here is one of my favorite articles on him on editing. Nick Turpin is one of the anchors in the street photography community and has been working extremely hard in pushing street photography as a serious art in the community. He is also the founder of In-Public and has a fantastic eye when it comes to street photography. Although his blog Seven Seven Nine isn’t updated nearly as often as I’d like–it is still a treasure chest full of great information and insights. Yanidel is a passionate and extremely consistent street photographer from Paris who recently quit his job to travel the world for 80 weeks (the man has balls). I had the great pleasure of meeting with him when I was in Paris, and the guy not only loves street photography but blogging as well. Live vicariously through him and check out his blog! Josh White is a street photographer that I stumbled upon a couple months back and even had an interview with him on my blog. He describes himself as a “law student on extended vacation in Korea” and is obsessed with documenting the streets of Seoul. Not only does he take great photographs, he also has a plethora of street photography gear (Leica M9, Leica X1, Fujifilm FinePix X100, Ricoh GRDIII, Ricoh GXR, etc) and gives great “real world” reviews. Peep him now! 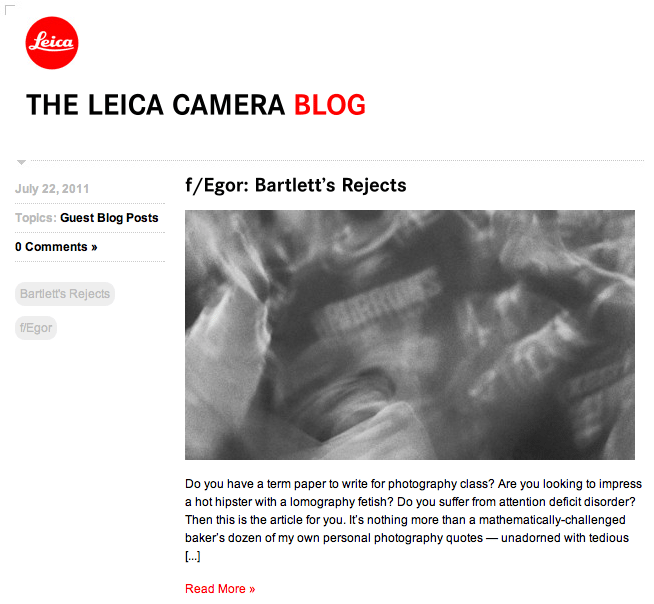 Severin Koller is a damn good street photographer and has been featured on the Leica blog recently. He hails from Vienna and looks like he is out and about doing street photography workshops with Chris Weeks all around the world right now. Check out his blog for his inspirational images. for emerging photographers. All the images included are extremely well-curated, so you know every visit you make you will see some truly great images. Highly recommended for any serious street or journalist photographers out there. The guys working at street hunters are one of the newest street photography blogs on the block, offering insightful tutorials, tips, and tricks. If you need some inspiration or tips, check them out! When I started street photography, I first came across the street photography collective in-public. They do regular interviews on their blog, and are always a great source of inspiration. I came across F.D. Walker’s blog on street photography — Shooter Files totally by chance. I love how he has bridged street photography and travel photography so well, as well as his enthusiasm and passion. He has great shots and insights, make sure to check him out.